It wasn't a serious question, but I did ask it. What’s So BioWare About the Next Command & Conquer? Me: I've seen armor from one BioWare game appear in the other. Do any of these games take place in the same universe? 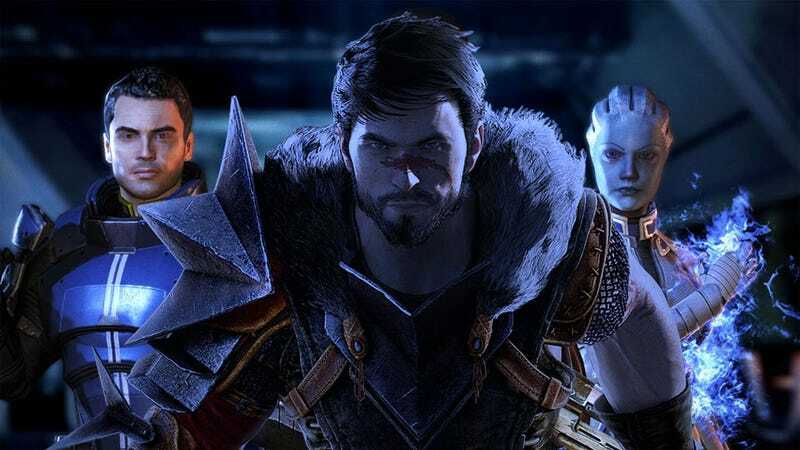 Are Dragon Age and Mass Effect in the same universe? Would that break a rule? Ray Muzyka: I did wear my Dragon Age blood dragon armor for a good period of Mass Effect 2. Greg Zeschuk: I don't… Is Mass Effect the past or the future? Me: So you're telling me Dragon Age is a video game series within the Mass Effect universe. I like that idea. Shepard is playing Dragon Age. Zeschuk: In the future, it's the greatest franchise ever. Me: I like it. I think every game should be played in one of the others. And it should just telescope out. Muzyka: Maybe we're in a game right now. Zeschuk: Think of all the emotional engagement we could have. Muzyka: And I'll tell you one thing, Stephen, if that's not emotionally engaging, I don't know what is.